Autophagy is one of the three principal mechanisms used by cells to sequester, remove and recycle waste, the others being proteasomal degradation and phagocytosis. In autophagy, macromolecules in the cytosol are engulfed in a newly formed phagocytic body and subsequently digested in a special lysosome that releases the resultant metabolites back into the cytosol. Autophagy, often referred to as macroautophagy, serves to recycle large chunks of cytoplasm as a source of nutrients, which enables cells to maintain macromolecular synthesis and energy homeostasis during starvation and other stressful conditions. Moreover, cells use autophagy to regulate the activity of specific signaling proteins, to prevent accumulation of damaged organelles or long-lived, aggregate-prone proteins, and to remove incoming threats such as intracellular pathogens. Thus, autophagy has emerged as a critical component of innate immunity. The classical autophagy pathway proceeds through a series of well-defined steps. It begins with nucleation of an isolation membrane, which subsequently elongates to envelop the portion of cytoplasm to be removed. Closure of this membrane forms a double-membrane vesicle known as the autophagosome, which then fuses via its outer membrane to a lysosome to form an autolysosome. Disintegration of the inner membrane exposes the sequestered cytoplasmic cargo to lysosomal hydrolases, which break down the material into its constituent metabolites 1, 2. The classical autophagy pathway requires the concerted action of a set of evolutionarily conserved genes. Vesicle nucleation depends on a class III phosphatidylinositol-3-OH kinase (PI(3)K) complex formed by Beclin 1, Vps34 and other proteins. Atg7 participates in two ubiquitin-like conjugation pathways: conjugation of Atg5 to Atg12, and conversion of LC3 to its phosphatidylethanolamine (PE)-conjugated LC3-II form. The Atg5-Atg12 conjugate forms a large complex with the Atg16L1 protein. Both conjugation systems are required for the generation of the autophagosome. Nonetheless, it is important to remember that these and other autophagy proteins also execute many non-autophagy functions. Thus, a crucial challenge facing researchers is to distinguish “true” autophagy signaling from other types of autophagy-protein signaling. During starvation or certain forms of stress, cells use autophagy to digest and recycle large, non-specific parts of their cytoplasm. However, autophagy can also be used to spatiotemporally regulate immune signaling pathways (e.g. by recycling activated proteins to limit cytokine production) and block inflammation (e.g. by removing damaged mitochondria before they can release harmful reactive oxygen species). To isolate and remove specific threats, cells use a selective form of autophagy in which the targeted cargo must first be tagged by ubquitination. The ubiquitinated cargo is then dragged and bound to the isolation membrane via LC3 by one of various sequestosome-like proteins (SLRs) such as p62, optineurin, Parkin or PINK1. Selective autophagy of mitochondria is known as mitophagy, whereas that of pathogens is known as xenophagy. Autophagy has been extensively linked to innate immune signaling pathways—for example, during cellular responses to damage-associated molecular patterns (DAMPs) and pathogen-associated molecular patterns (PAMPs). In fact, autophagy regulates, and is regulated by, pattern recognition receptors (PRRs) such as Toll-like receptors (TLRs), Nod-like receptors (NLRs), RIG-I-like receptors (RLRs), cytosolic DNA sensors (CDS) and Stimulator of Interferon Genes (STING) as well as inflammasomes. This interplay encompasses positive as well as negative regulatory mechanisms that ensure acute inflammatory responses while preventing hyperinflammation. Interestingly, autophagy and its signaling proteins have been associated with inflammatory disorders, including Crohn’s disease (CD), certain cancers, and autoimmune diseases such as sclerosis and systemic lupus erythematosus (SLE) 3. Additionally, defective autophagy has been implicated in neurologic disorders characterized by accumulation of protein aggregates, including Parkinson’s disease. The TLRs comprise cell-surface (TLR1, TLR2, TLR4 and TLR6) and endosomal (TLR3, TLR7, TLR8, TLR9 and TLR13) receptors, each of which responds to cognate DAMPs and PAMPs of self, pathogenic or tumoral origin. Representative TLR ligands include bacterial compounds such as lipopolysaccharide (LPS; TLR4), flagellin (TLR5) and peptidoglycans (TLR2); and nucleic acids such as DNA (TLR9) and RNA (TLR3, TLR7, TLR8 and TLR13). Activation of TLRs leads to production of pro-inflammatory cytokines and, in some cases, to production of type I interferons (IFNs). 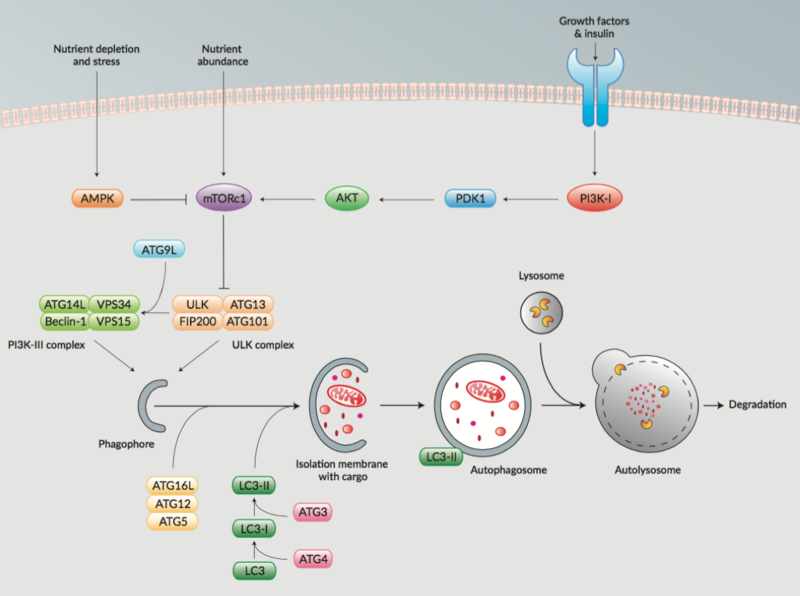 TLRs have been shown to promote autophagy: in fact, several groups have reported the induction of autophagy by signaling through TLR4, TLR7, TLR3, TLR2 or TLR5 4-6. TLR-induced autophagy appears to depend on the adaptor proteins MyD88 and TRIF; in both cases, via direct interaction with Beclin 1 6. TLR ligands stimulate formation of autophagosomes and autolysosomes in immune cells such as macrophages 7, and TLR-induced autophagy has been demonstrated in vivo, in murine models of bacterial and viral infection 8. The autophagic machinery can deliver DNA and RNA to endosomal TLRs. In fact, autophagy and a closely related process, LC3-associated phagocytosis (LAP) have each been reported to be required for recognition of nucleic acids by TLR7 and TLR9 in dendritic cells 7. Intriguingly, TLR-induced autophagy has also been implicated in certain diseases. For instance, TLR3- and TLR4-induced autophagy have been linked to the migration and invasiveness of lung cancer cells 9. Other innate immune receptors have been described to work in concert with autophagy, and this is likely to be cell-type specific 10,11. These include the cytoplasmic receptors, Nucleotide-binding Oligomerization Domain-containing protein 1 and 2 (NOD1 and NOD2), which sense the bacterial peptidoglycan derivatives D-glutamyl-meso-diaminopimelic acid (iE-DAP) and muramyl dipeptide (MDP), respectively. In macrophages, NOD1 and NOD2 interact with Atg16L1 and signal to induce autophagy, and in dendritic cells, activation of NOD2 by bacterial ligands leads to generation of autophagosomes 7. The cGAS/STING pathway is a major signaling hub for innate immune responses to cytoplasmic self or foreign DNA. The sensor cGAS detects dsDNA (and DNA/RNA hybrids), and then produces the messenger molecule 2’,3’-cGAMP, a cyclic dinucleotide that activates the adaptor protein STING. In turn, STING drives production of type I IFNs and pro-inflammatory cytokines. STING can also be directly activated by cyclic dinucleotides (CDNs) released into the cytoplasm by invading microbes. The cGAS/STING axis has been linked to autophagy on various levels. For example, it triggers both autophagy and type I IFN production during M. tuberculosis infection 7, and has been reported to be required for selective autophagy of this pathogen 12. Furthermore, following activation, STING seems to be trafficked from the endoplasmic reticulum to the Golgi by an autophagy-like process that depends on Atg9a 7. Intriguingly, cGAS has been reported to be degraded by p62-dependent selective autophagy after it senses cytoplasmic DNA 13. Interestingly, the cytoplasmic DNA sensor AIM2 has been reported to inhibit STING-induced autophagy during M. bovis infection 14. There have been reports that cGAS and STING each interacts with autophagy proteins in other contexts, although the nature of these interactions remains opaque. For instance, direct interaction between cGAS and Beclin-1 halts production of 2’,3’-cGAMP by the former 15, thus preventing activation of STING and hyperproduction of type I IFNs. Moreover, trafficking of STING appears to involve Atg9a 16. The innate immune arsenal also includes the RIG-I-Like receptors (RLRs), which respond to cytoplasmic self or foreign RNA, including viral RNA. The principal RLRs are RIG-I, which detects shorter dsRNA, and MDA-5, which detects longer dsRNA. Upon activation, each of these activates the adaptor protein MAVS, which then induces type I IFNs and pro-inflammatory cytokines. Although very little is known about the interactions between RLRs and autophagy, there is evidence that autophagy proteins can negatively regulate RLRs to limit type production of I IFNs following detection of self or foreign RNA in the cytoplasm. For example, a conjugate of the autophagy proteins Atg5 and Atg12 interfere with signaling between dsRNA sensors (MDA5 or RIG-I) and the adaptor protein MAVS 17. Similarly, ubiquitin-specific protease 19 (USP19), which has been described as a positive regulator of autophagy, has been shown to inhibit the interaction between RIG-I and MAVS in a Beclin-1-dependent fashion, which results in diminished IFN signaling 17. Inflammasomes are complexes that comprise an innate immune sensor (either AIM2, NLRP1, NLRP3 or NLRC4), plus the adaptor protein Apoptosis-associated Speck-like protein containing a CARD (ASC), and pro-Caspase 1. Each inflammasome is named after its constituent sensor. Inflammasomes are crucial for generating inflammatory responses to DAMPs and PAMPs such as cytosolic DNA (AIM2), MDP (NLRP1), uric acid (NLRP3) and flagellin (NLRC4). Activation of inflammasomes induces predecessors of the inflammatory interleukins IL-1 and IL-18. Autophagy has been demonstrated to regulate activation of inflammasomes as a way to limit inflammation. It can do this directly by either digesting the interleukin precursors (e.g. pro-IL-1) produced by inflammasomes, or recycling the inflammasome components themselves (e.g. NLRP3, AIM2 and ASC) 18. Alternatively, autophagy can also indirectly prevent activation of inflammasomes, by breaking down damaged mitochondria to prevent them from releasing inflammasome-activating ligands such as mitochondrial DNA (mtDNA) and ROS. Indeed, activation of MAVS at the membrane of damaged mitochondria has recently been shown to induce autophagy through direct interaction with LC3, which leads to removal of the deleterious organelle 19. Accordingly, cells deficient in the autophagy protein Atg5 accumulate damage organelles and consequently, exhibit augmented production of type I IFNs 20. The awarding of the 2016 Nobel Prize in Physiology or Medicine to Yoshinori Ohsumi, who discovered the mechanisms of autophagy, reflects growing appreciation for the paramount role of this cellular process in health and disease. Nevertheless, recent advances in this field suggest that we are only just beginning to elucidate the interplay between autophagy and innate immune signaling pathways. 1. Levine B. & Kroemer G., 2008. 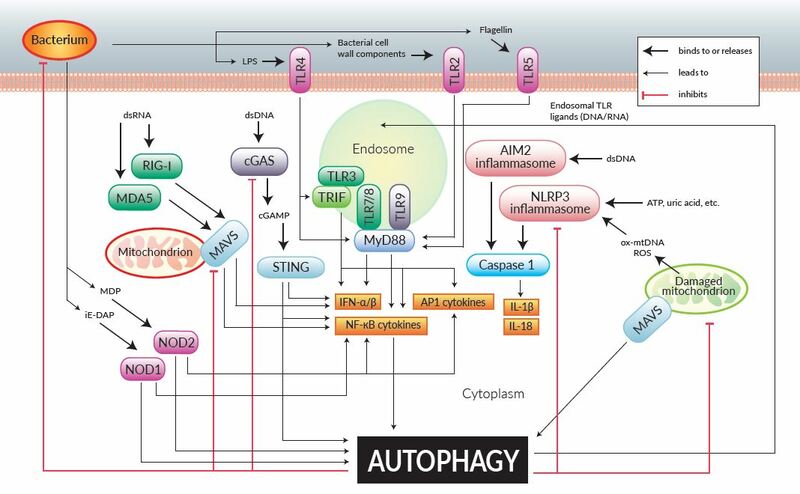 Autophagy in the pathogenesis of disease. Cell. 132(1):27-42. 2. Mizushima N. et al., 2008. Autophagy fights disease through cellular self-digestion. Nature. 451(7182):1069-75. 3. Netea-Maier et al., 2016, Modulation of inflammation by autophagy: Consequences for human disease. Autophagy. 12(2): 245–260. 4. Xu Y. et al., 2007. Toll-like receptor 4 is a sensor for autophagy associated with innate immunity. Immunity. 27(1):135-44. 5. Delgado MA. et al., 2008. Toll-like receptors control autophagy. EMBO J. 27(7):1110-21. 6. Shi CS. & Kehrl JH., 2008. MyD88 and Trif target Beclin 1 to trigger autophagy in macrophages. J Biol Chem. 283(48):33175-33182. 7. Shibutani et al., 2015. Autophagy and autophagy-related proteins in the immune system. Nat Immunol. 16(10):1014:1024. 8. Zhan et al., 2014, Autophagy facilitates TLR4- and TLR3-triggered migration and invasion of lung cancer cells through the promotion of TRAF6 ubiquitination. Autophagy. 10(2):257-68. 9. Zhan et al., 2014. Autophagy facilitates TLR4- and TLR3-triggered migration and invasion of lung cancer cells through the promotion of TRAF6 ubiquitination. Autophagy. 10(2):257-268. 10. Kroemer G. et al., 2010. Autophagy and the integrated stress response. Mol Cell. 40:280–293. 11. Deretic V., 2012. Autophagy as an innate immunity paradigm: expanding the scope and repertoire of pattern recognition receptors. Curr. Opin. Immunol. 24(1):21-31. 12. Watson et al., 2015. The Cytosolic Sensor cGAS Detects Mycobacterium tuberculosis DNA to Induce Type I Interferons and Activate Autophagy. Cell Host & Microbe. 17:1-9. 13. Chen et al., 2016. TRIM14 Inhibits cGAS Degradation Mediated by Selective Autophagy Receptor p62 to Promote Innate Immune Responses. Mol Cell. 64:1-15. 14. Liu et al., 2016. AIM2 inhibits autophagy and IFN-β production during M. bovis infection. Oncotarget. 7(30):46972-46987. 15. Liang et al., 2014. Crosstalk between the cGAS DNA Sensor and Beclin-1 Autophagy Protein Shapes Innate Antimicrobial Immune Responses. Cell Host & Microbe. 15:228-238. 16. Saitoh et al., 2009. Atg9a controls dsDNA-driven dynamic translocation of STING and the innate immune response. PNAS. 106(49):20842–20846. 17. Jin et al., 2016. USP19 modulates autophagy and antiviral immune responses by deubiquitinating Beclin-1. EMBO J. 35(8): 866–880. 19. Sun et al., 2016. MAVS maintains mitochondrial homeostasis via autophagy. Cell Disc. 2:16024. 20. Chan & Gack, 2015. RIG-I-like receptor regulation in virus infection and immunity. Curr. Opin. Virol. 12:7-14.